Sheffield Students' Union is opening a whole shop dedicated to environmentally friendly household goods and wholefoods without the packaging. From Monday 23rd April, Our Zero Waste Shop will be selling a huge range of spices, herbs, grains, legumes, dried fruits and nuts all free from wasteful plastic packaging. Each product will be sold by weight so you can buy as much or as little as you need. Just bring your own container, buy one from us, or use one of our recyclable paper bags. We will also have refill stations for your empty bottles of household products, with everything from laundry detergent, to liquid hand soap and multi-surface cleaner. There’s no need to buy a new bottles of product - it’s cheaper and less wasteful to refill! 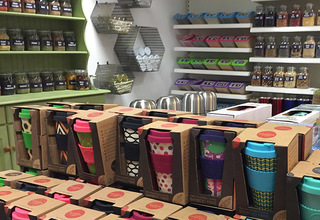 You will also be able to pick up a range of recycled and sustainable products from recycled kitchen and toilet roll to sustainable bamboo cutlery and kitchenware. As well as providing a range of ethical, reusable & sustainable products, the shop also hopes to bring knowledge about about wider ethical and environmental issues to customers as well as recipe suggestions.